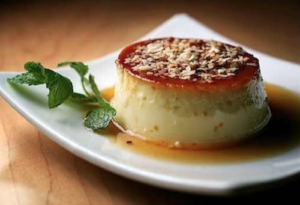 The first bite of this creamy flan will surprise you with its light carmel coconut flavor. Made with coconut milk, eggs, molasses and Swerve Sweetner, it's gluten free and Keto Diet friendly. For the flan, preheat the oven to 325F and butter 8 small ramekins or custard cups. Place ramekins inside a large baking dish. Beat in coconut milk, sweetened condensed milk, erythritol, shredded coconut and vanilla extract until well combined. Divide mixture evenly among prepared ramekins. Pour boiling water into baking dish around flans so that it comes about 2/3 up the side of ramekins. Carefully transfer baking dish into pre-heated oven and bake 45 to 55 minutes, or until lightly browned on top and set but center is still a tiny bit wobbly. Remove from oven and let cool. Wrap each tightly in plastic wrap and refrigerate until ready to serve. For the caramel sauce, combine xylitol, water and molasses in a small saucepan over medium heat. Stir continuously until xylitol is melted. Bring to a boil and then remove from heat and let cool and thicken slightly. To serve, run a sharp knife around each flan and invert onto a plate (you will have to jiggle somewhat to get it to come out...I found this easiest by holding plate and upside-down ramekin together and giving it a good shake). Drizzle with caramel sauce, sprinkle with flaked coconut and serve. OPTIONAL: Garnish with fresh seasonal berries for an extra taste treat! White Chocolate Keto Truffles Guilt Free Low Carb Strawberry Shake - Yummy!